Buyer: means the individual or organisation that buys or agrees to buy the Goods from the Seller. Contract: means the contract between the Seller and the Buyer for the sale and purchase of Goods incorporating these Terms and Conditions. Accountants: Cholmondeley House Dee Hills Park Chester CH3 5AR Cheshire United Kingdom. Terms and Conditions: means the terms and conditions of sale set out in this agreement and any special terms and conditions agreed in writing by the Seller. The Original manufacturer of branded goods other than that Hugo & Otto manufacture in England and represent from around the globe. The original Manufacturer in all circumstances of product complaints, or manufacture failure will be consulted by Hugo & Otto in the first instance on product quality or failure. The Buyer's statutory rights as a Consumer is not affected by any of these terms & conditions set out. You are also protected by the Distance Selling Act. These Terms and Conditions shall apply to all contracts for the sale of Goods by the Seller to the Buyer and shall prevail over any other documentation or communication from the Buyer. Where the Goods ordered by the Buyer are not available from stock the Buyer shall be notified and given the option to either wait until the Goods are available from stock or cancel the order and receive a full refund within 30 days. The buyer must ensure that all contact details for the transaction and purchase is correct at registration and completion of purchase. Hugo & Otto reserves the right to withdraw any products from sale if the buyer cannot be contacted. The total purchase price including delivery charges, if any, will be displayed in the Buyer's shopping cart prior to confirming the order. The total purchase price of the sale of goods will be displayed in your shopping cart however, because of the nature of worldwide shipping rates, different courier rates, weights and sizes of boxes. Once you have checked out you will find that a standard rate of shipping will have been added. This standard rate of shipping only applies to goods shipped between the UK & Mainland Europe (excluding Northern Europe and the Islands of Europe). Goods shipped to all other countries will have to be weighed and measured for an accurate shipping quote and your total cost may have to be changed. Please do email sales@hugoandotto.com for information on your shipping costs. If you need assistance we are happy to help you and would ask that you please email for information on delivery charges, Tax & shipping charges to your Country. We always endeavour to obtain the very best affordable shipping quotes and work hard alongside our customer to ensure the best rates are agreed prior to shipping. The customer is fully responsible for their own Country tax and customs landing charges at the destination. Payment of the goods, including shipping charges must be made in full prior to dispatch of the Goods. If your items are in stock and available for immediate shipping we give a guide of approximately 10-12 working days from receiving your order depending on the destination. In all cases we will email your shipping reference numbers for you to track also as soon as we receive them and we will also track your shipping from the UK. In Stock large or heavy items or goods: a courier service is required as a guide please allow approximately 3-4 working days from door to door for deliveries. Items can be fast tracked to your door within 24 hours if they are in stock but there may be an extra charge if the courier levies this. Please email us and we will get a live quote for you for this service. Back orders, Special Orders, Bespoke Orders and dropship orders from the Manufacturers: We will advise you of approximate delivery dates at all times and shipping tracking numbers will be emailed to you once your order is processed and on it's way to you. Wolfpack New York dog coats the suppliers will provide us with their estimate of making your bespoke item and will email the shipping reference numbers when they ship to you direct. Where specific delivery dates have been agreed, and where this delivery date cannot be met, the Seller will endeavour to notify the Buyer and give the opportunity to agree a new delivery date or receive a full refund. Delivery of the Goods shall be made to the Buyer's address specified in the order and the Buyer shall make all arrangements necessary to take delivery of the Goods whenever they are tendered for delivery. Title and risk in the Goods shall pass to the Buyer upon delivery of the Goods. The exception to this is bespoke garments and items that the Seller takes possession of at the time of fitting or goods purchased by the Seller in the Studio/showroom which are taken away at the time rather than delivered. The Seller warrants that the Goods will at the time of dispatch correspond to the description given by the Seller. From time to time it may be necessary to make small changes to the items, which will be of an equal or greater value than that shown on the website. The Buyer shall inspect the Goods immediately upon receipt and shall notify the Seller or return the items within 14 days of Invoice date in writing if the Goods are damaged or do not comply with any of the Contract. If the Buyer fails to do so the Buyer shall be deemed to have accepted the Goods. Goods must be returned by the Buyer at the Buyer's expense and should be adequately insured during the return journey with proof of posting. The Buyer will receive a refund of all monies paid for the Goods. The exception is in the rare event that the product supplied is faulty and within 28 days of purchase of goods, in which case the Seller will pay for return postage and insurance and offer a refund or exchange. Any Clearance Items or Sale items purchased are non refundable if returned past the timeframe of seven days from the date of Invoice. In this rare event the buyer will be eligible for a credit note only. Postage charges are applicable for Sale & Clearance item exchanges. All returns should be clearly labelled and addressed to: Shipping information and shipping reference numbers should be sent to sales@hugoandotto.com and we request that you insure the shipment to the full value of the goods as per your invoice. You are responsible of the safe return of all goods until they are received, we cannot accept any loss or value. The Hugo & Otto gift card can be purchased or redeemed at our company owned offices in the UK and at our company-owned web-store www.hugoandotto.com as permitted by law. The Hugo & Otto gift card can only be used to purchase goods at Hugo & Otto Limited and not any other store or direct supplier to Hugo & Otto. Hugo & Otto Gift Cards may not be exchanged for cash or change given for transactions. Gift Cards will expire after 12 months of purchase and any balance will be forfeited thereafter. Hugo & Otto is not responsible for any lost, stolen, or damaged cards. All refunds on purchases made using a debit or credit card will be re-credited to the original card that was used. Hugo & Otto Limited has system set in place with it’s registered banks and internet systems to protect the legal owner of a credit or debit card and also the supplier Hugo & Otto Limited against fraud. Hugo & Otto Limited will contact the registered customer if the Bank flags up a warning against a card that has been used for payment of goods. The goods will not be dispatched until these checks are completed and also retain the right to refund the card. Bank warnings can flag up for simple reasons if contact information is incorrect or sadly at worst case sanario if they suspect fraud has taken place they will enforce a Warning that a card has failed all security checks and advise to refund payments. Please do note: Fraudulent actions against Hugo & Otto is a serious offence and will report any suspicious actions immediately to “Action Fraud” in the UK. Used to recognise the same user when they click from page to page. Remembers what is in your shopping basket. The cookie expires when you close your web browser. A further category of cookies which we have identified we have called 'Performance Cookies' and we use these only to improve our site or measure response rates. All information collected by these cookies is anonymous and does not in any way impact on your privacy. This cookie is typically written to the browser upon the first visit to Hugo & Otto from that web browser. This cookie is used to determine unique visitors to Hugo & Otto and it is updated with each page view. Expires 2 years from set/update. This cookie is used to establish and continue a user session with Hugo & Otto. When a user views a page on Hugo & Otto, the Google Analytics code attempts to update this cookie. This cookie expires when a user pauses on a page on Hugo & Otto for longer than 30 minutes. This cookie stores the type of referral used by the visitor to reach Hugo & Otto, whether via a direct method, a referring link, a website search, or a campaign such as an ad or an email link. It is used to calculate search engine traffic, ad campaigns and page navigation within Hugo & Otto. Customers in the European Union: You may cancel your order up to fourteen days from the day on which you receive the Goods. If you wish to cancel your order, you will have to return any items within seven days of when you tell us that you would like to do so and at your own cost for return or exchange as required. We are unable to accept returned Goods that We reasonably believe are not in resaleable condition or that have been used, unless the Goods were faulty or damaged when received. Please do not use or place your dog in any item due to health & safety reasons. You must understand that these items do have to be sold on. Please obtain proof of posting and advise you to obtain insurance for the return as we cannot be held responsible for packages lost on return to us. All goods and products purchased from Hugo & Otto must be returned to us unused and in their original packaging and in a re-saleable condition. Because of the nature of some of our luxury products with natural sheep wool lining that cannot be washed down and can be contaminated by dog hair intertwining inside the threads we hold the right to refuse returns as they will not be in a re-salable condition. Therefore we ask that you use caution when handling your product and do not let your dog jump onto dog beds, inside dog carriers etc. Should you fail to return such goods to us, we may arrange for their return to us and we will charge you any reasonable expenses incurred in our doing so. If you have ordered any service from us you have seven working days after the day that you place your order in which to cancel. However your right to cancel any service ends when our performance of the service starts even if that is within your cancellation period. All returned goods must be paid by the customer prior to return to Hugo & Otto Limited whether in England, Scotland, Wales the Channel Islands, Europe and Worldwide. On all returns please provide a proof of posting/shipping reference number or request for a Signed for service to enable tracking from end to end to take place. If any products are the incorrect size or colour to what you have ordered without Hugo & Otto notifying you of the change in writing by email, Hugo & Otto will organise to repatriate the goods and exchange the products as soon as is possible at no extra charges. If you find that the products do not fit or if you have ordered incorrectly, or you would like to change the product for an alternative sizing this can be accommodated. The product must be sent back at the cost to the "buyer" to the "seller" and costs will be incurred by the "Buyer" and replacement products also incurred by the "buyer"
To avoid this and to best serve you as a customer we are more than delighted to offer you help and advice either by phone or by email. 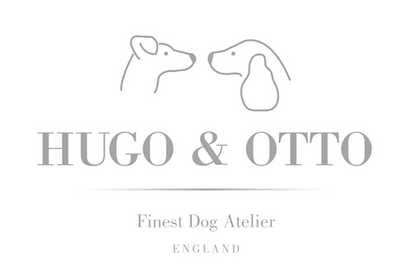 We would always encourage you to contact Hugo & Otto on sales@hugoandotto.com for advice on sizing, colouring, measuring and dog product advice. All international shipments are sent/received by International Courier and will change according to the Country of your residence. Please email us with any questions on courier shipments and expected delivery timelines. In the case of cancelled orders, payments will be refunded within thirty days. Alternatively, should any goods be unsuitable due to miss-sizing, we are happy to offer an exchange or to offer Hugo & Otto store credit, the product must be returned to Hugo & Otto with the original packaging and labels intact and not used. Should you wish to return any goods for exchange, or store credit, you must call or email us in the first instance in order that we may issue a returns authorisation number for tracking purposes within the accounting system. Please do note, we regret that orders for goods made to your special requirements, sizes, colours or specifications will not have any right to cancel or return. UK Bank Holidays, Easter and Christmas Holidays Please Check in for store closure dates. You may also wish to email us on sales@hugoandotto.com and we will answer your request or questions within 24 hours of receiving your email. Goods that have been damaged in transit and to be returned please telephone or email our offices to request an address return label. All goods returned to us must be unused, in their original packaging, with labels intact and in re-saleable condition. They must not be damaged in any way as we will not be in a position to re-sell the stock. If you have ordered any service from us you have seven days from the day that you place your order in which to cancel. However your right to cancel any service ends when our performance of the service starts even if that is within your cancellation period. Alternatively, should any goods be unsuitable, we are happy to work with you and to exchange through goodwill them or to offer store credit, you will however have to pay your own returns carriage costs and any customs charges at your destination and also forwarding onto the UK. Should you wish to return any goods for exchange, refund or store credit, you must call or email us in the first instance in order that we may issue a returns authorisation number. We regret that Goods made to your specifications and sizing may not be returned unless they are found to be faulty upon receipt of the goods. Please ensure that all goods returned are suitably packed. We recommend that you insure any goods that are returned to us as we will not be liable for any damage or loss during transit. Please ensure that any goods returned are accompanied by the returns authorisation number and your receipt. Please note that, if you return goods that were ordered by another person, any refund due will be made to the person who placed the order. All prices are quoted in Pounds Sterling (£). If your delivery address is outside the European Union, any import duties or taxes and customs or clearance charges that are payable in the recipient's country are solely the responsibility of you the customer, the recipient. They will not be refunded by us should you wish to cancel your order or to return any goods to us for exchange or refund. Please also note that you must comply with all applicable laws and regulations of the country for which the products are destined. We will not be liable for any breach by you of any such laws. Please note that customs may open and inspect packages and that the cost of the goods must be specified on the documentation attached to the package, even if it is a gift. All purchases made on stand would normally be ordered on the day from the website or from an order book and an approximate delivery date will be given to you when you purchase your goods. You will then receive your goods delivered to your door. Any or All goods seen on stand and paid for on the day and are taken away by the customer will be deemed as "sold as seen" they are in an immaculate condition prior to being displayed and one would hope would stay in this condition throughout the event. At events customers with dogs naturally look at products as they would in store, many events now are held in grassy fields and open to the elements. We at Hugo & Otto will do our utmost to protect and display our beautiful products in the best possible way, but it is often not as good as it would be in a store inside with air-conditioning. Therefore any items that are sold on stand on the day are sold unpackaged, unboxed and as seen. Any goods that are marked on site may at our discretion be marked down in price but once this is agreed with the consumer then no other discount will be offered once the goods have been accepted, paid for and taken away, these will be regarded as "sold as seen" we do so hope that you understand this condition of sale which is normal in any open air event. Hugo & Otto do not charge any extra fees for customers using Paypal accounts to pay for their goods. Paypal levy the company over the customer and the fees are heavy. In many cases companies will charge a surcharge for each payment used for purchasing and this is normally set between 2.4% & 3.5% in the UK and upto 6% for International transactions. Hugo & Otto have decided not charge the customer the Paypal fees unless the fee has to be reversed in the case of a cancelled order by the customer. Paypal charge the company a reversal or charge back fee of 3.46% for UK transactions and a further 5.2% for International reversal transactions plus a £14.00 levy in the case of charge backs. Hugo & Otto cannot take this charge and not sell the goods because of a cancelled order and the company has the right to deduct these Paypal fees in full to recover lost revenue. Charge backs mean that if a payment has been proven as fraudulent and Paypal have to reverse the fee charges. Hugo & Otto will have lost the goods in transit and also the funds. Paypal in these cases cover both the original card holder and also Hugo & Otto so long as proof of posting has been carefully taken by Hugo & Otto (the company) and contact has been made by Hugo & Otto to the customer. In the case where Paypay suspect that a fraudulent transaction has taken place they will alert Hugo & Otto (the company) and advise to contact the customer by telephone or email by the information given by the customer. If the customer does not respond, goods will not be sent out until contact is made. If the customer does not make contact after 54 days then the full amount of the transaction will be reversed by Hugo & Otto, Paypal will be notified and the goods will not be sent out. In the case of reverse charges for a cancelled order Hugo & Otto withold the right to reverse the transaction fee minus all charges by Paypal so that Hugo & Otto (the company) is not left in a deficit. Hugo & Otto (the company) will not charge a handling fee on top of this. We refer you to the manufacturers care labels on all textile based products. Where a product is made from textiles an adequate care label with symbols to provide you with instructions as standard. We would refer you to read the Manufacturers care label instructions that are provided on the products and in most cases these are usually found sewn into the seam of the textile dog product. Dog Products that are manufactured from wood laminate, solid wood, stainless steel and leather dog products may require a simple care programme. The manufacturer may supply a printed care label or card with the product - it is not a current legal requirement unless it is a textile based product. We would ask that in all cases refer back to Hugo & Otto for advice at sales@hugoandotto.com where we can help you with your care of dog product requirement from the advice given from the manufacturer. Any damages incurred to your dog product after sale of goods sold in good order and faith by Hugo & Otto and which cannot be repaired either to missuse or undue care and attention cannot be claimed for against faulty products. We would ask you to contact us by email in the first instance and we will arrange with you to repatriate your goods for inspection by both Hugo & Otto and also the manufacturer of origin. You may incur shipping charges in the case of large dog products that have to be shipped back to the manufacturer. If the manufacturer of origin deems that the dog product does not have a manufactured defect and the damage is due to handling or misuse they are within their rights to refuse to offer compensation or exchange of dog product. Hugo & Otto will have to abide by their decision as this is final. We will endeavour to help and assist you at all times, however, If you feel your statutory rights have not been obligated by Hugo & Otto you have the right to contact your Trading Standards Office. It is a legal requirement that any products that may have be dangerous must have adequate safety instructions. In all cases please email sales@hugoandotto.com should you not find a care label on your product or you require extra assistance.